One man. One fight. The ultimate sacrifice. 2	3	Voiceless DVD	In Stock - Order before 4pm for same day dispatchWant it on Tuesday 23 April? For fans of the God's Not Dead films, and War Room, comes a film that is a challenging drama of fighting for your beliefs. Want a strong film with a good message? Following in the footsteps of films like God's Not Dead (1&2), War Room, and October Baby comes a film that is unafraid to challenge the world, and wear its belief on its sleeve. Suitable for ages 12 and over, Voiceless is a gripping Christian film that brings a strong voice into the pro-life issue, one that is uncompromising, unwavering, and will change where you stand in your beliefs. 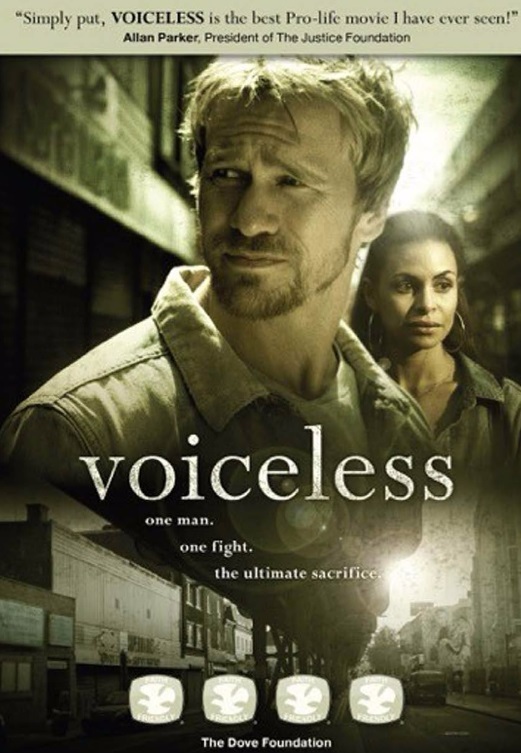 Voiceless is the story of one man's fight that may cost him absolutely everything. That man is Jesse Dean. Recently discharged from the US Army, Jesse stumbles into a job with a waning Philadelphia Church, as their outreach leader. Wasting no time, and refusing to settle for conventional methods of outreach, Jesse sets up a boxing club to connect with those around the Church. But, sat directly across from the old Church is a prominent Family Planning clinic. Disturbed to see that the Church remains silent whilst a clinic performing abortions is free to operate just a few meters away, Jess begin to take actions. Preaching, protesting, convincing women who enter to change their mind: Jess puts his all into living out his convictions, and creating ripples throughout his community. As the two sides become more heated, a tragedy strikes which challenges everyone involved to ask themselves what is right, and what isn't. A film to challenge you into standing up for what's right, Voiceless continues the powerful themes of God's Not Dead (1 & 2) and War Room: films that aren't afraid to challenge the world outside, and will show you of the importance of standing up for your convictions. Even if the whole world says otherwise. Voiceless DVD by Provident was published by Authentic in January 2017 and is our 10281st best seller. The ISBN for Voiceless DVD is 5060424955787. We were very disappointed with this film. It was very drawn out with what seemed to be very little talking, action or story to it. It had so much protential and could have been a very good film with a very relevant story line but sadly it isn't. Sadly, it was was very disappointing, dead and only seemed to focus on the word "Murder." No actual scripture or real advice given to those in this dilema. It was very long and drawn out. A very dead film with an empty end. It could have been so much better. I would not recommend this film. Take a peek at some articles related to Voiceless DVD. Got a question? No problem! Just click here to ask us about Voiceless DVD. A young, reserved, war veteran wanting to make a differ-ence in his community puts his life on the line to make a stand against an abortion clinic that has opened up across the street from his church. When Jesse Dean, a recently discharged soldier, moves to Philadel-phia to take a new job as an outreach leader at an old church whose membership has been declining, he discovers there's an abortion clinic directly across the street. A major confrontation ensues, which requires him to put everything on the line...not just his job, but his freedom, and marriage as well. The film encourages people to stand up for God's truths in society and overcome the spirit of retreat that has pervaded the church in regards to engaging with modern culture.